The Converse Blog: The Converse Blog: Even More Breaking News...maybe....Derrick Rose to Converse! The Converse Blog: Even More Breaking News...maybe....Derrick Rose to Converse! It seems like I've been doing this a lot lately. First with reports on Kevin Love and Michael Beasley, now with a report on Derrick Rose. 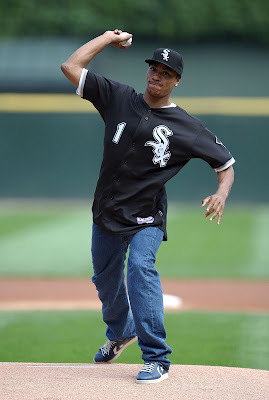 Again I haven't heard anything official, and he was photographed wearing Fila's the day before the draft. But this is the day after the draft, in a very public appearance. 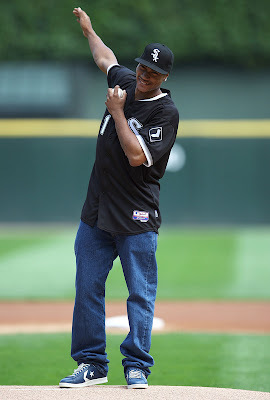 How public, throwing out the first pitch in the White Sox Public. He is also wearing a navy colorway of the Pro Leather Ox which I don't believe has been released yet. So accept this as pure speculation. This is very exciting. I do have an update on the Kevin Love signing, it also being reported through Sole Collector. If you would have told me that Converse signed just one of these three rookies I would very pleased. If they have actually signed all three, well I am not sure how I would respond. To put this perspective, Converse hasn't signed a number one draft pick since Larry Johnson in 1991. They also haven't signed the rookie of the year since Larry Johnson either. And while neither Rose, Beasley, or Love are locks for the award I like their chances, even with Oden being a rookie too. With the other brands reportedly shy about passing out endorsement dollars, Converse has the chance to make a big splash with this class. Labels: Converse, Derrick Rose, Fila, Greg Oden, Kevin Love, Larry Johnson, Michael Beasley, NBA, Rookie, sole collector, White Sox.